Save Emails to OneDrive is fully integrated with your Gmail email. 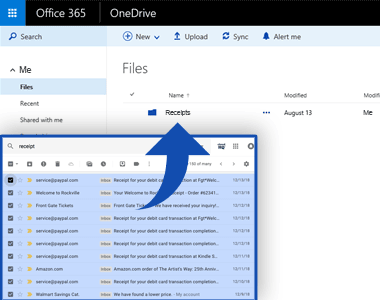 A single click directly from your Gmail inbox saves emails straight to your OneDrive folder. You never have to download anything to your hard drive, and can enjoy the ease of a full Gmail-OneDrive integration. Click here, which will take you the Google Chrome Webstore. Just click on the “Add to Chrome” button on the top right, then on the “Add extension” button, and you’re ready to go. Save Emails to OneDrive has almost universal 5-Star ratings from users who’ve downloaded it in Chrome. How Are People Using Save Emails to OneDrive? 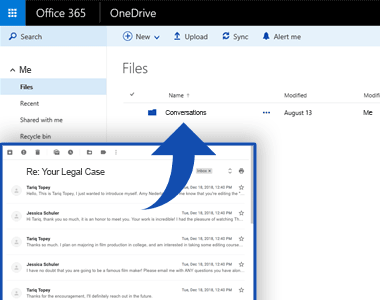 If you have important conversations with a client, lawyer, or a boss, you can save that directly to your OneDrive folder in order to document it. If you ever need to bring it up, it’s helpful to have a folder with all the pertinent conversations in it. 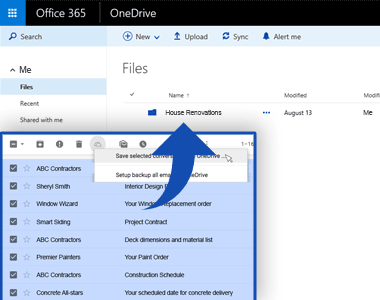 You can also organize your emails that pertain to a project instead of a person, like “house renovations”, and save that to your OneDrive folder. It’ll help you document everything you need in one easy-to-access place. Often, we get digital receipts- why not organize them into your OneDrive folder to share with your accountant? It’ll be a time-saver for him/her, and they’ll charge you less when they bill you by the hour. Teachers who like to organize their class lessons. Consultants who need to project manage multiple team members. Photographers who want all their photos organized in one shareable folder. Lawyers who need to organize emails by client. Realtors who need to organize emails by property. Journalists who need to organize their emails by story. Anyone who wants to be hyper organized so that they can save time from searching through emails later.